It’s about time that i write a post to promote my first book on CentOS High Availability. 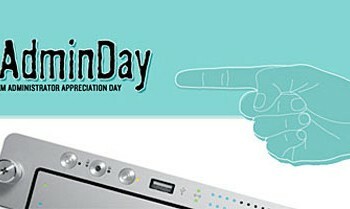 High Availability is quite a hot topic nowadays, nevermind the operating system you are using. 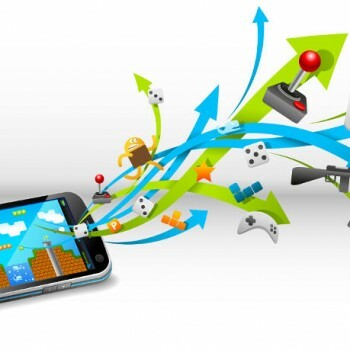 High availability has become a necessity not just in the IT world but also in other fields. People are used to services being available all of the time, if a service is not available, it’s not a good service. Since linux is my primary field of expertise, i mostly worked with high availability on linux systems and have good knowledge of it. 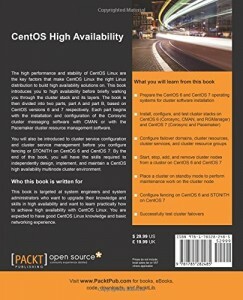 I also wrote some, now already “old” and “outdated”, posts about linux clustering on GeekPeek.Net which you can still find and so did Packt Publishing when they were looking for an author of the book called CentOS High Availability. I was contacted by Packt Publishing to write a book if i would be ready to write a book on CentOS High Availability. They said they read my posts on linux cluster and really liked it and that they are looking for an expert ready to devote some time to write a book about installing and configuring cluster on CentOS linux. I did not think long, i agreed to write a book on CentOS High Availability. I think i am really good at explaining complex stuff to people who know nothing about it. Sometimes when writing posts for GeekPeek.Net i just don’t have enough time to explain everything to the detail i would really like, but with this book i had to take time and i really did. I explained everything into as much detail as possible and did my best to make sure that even linux beginners would know how things work. Therefore my CentOS High Availability book is not just for advanced linux users and experts, I did my best to bring the topic of high availability, linux cluster installation and configuration process close to linux beginners too. Surely you must have some basic linux knowledge to know what i am talking about. If you are a first time linux user this book is definitely not for you. I started CentOS High Availability book with theoretical first two chapters. The first chapter is called “Getting Started with High Availability” and anyone who reads it, will probably understand it. I explained what high availability actually is and how it is achieved in IT with computer systems and clusters. The second chapter, also theoretical, is called “Meet the Cluster Stack on CentOS” and explains the software you can use to build linux cluster on CentOS linux. It is quite possible that even some of the advanced linux users might learn something new by reading this chapter. After the first two chapters the book splits in two parts. First part of the book is covering CentOS version 6 and the software called Corosync, CMAN and RGManager. This cluster stack (bundle of software) is official Red Hat Cluster Suite software for RHEL version 6 and this is why i decided to present this software running on CentOS 6. The second part of the CentOS High Availability book is covering CentOS version 7 and the software called Corosync and Pacemaker. Red Hat changed it’s official Red Hat Cluster Suite software with version 7 and this is now the latest greatest linux cluster software out there. For both parts of the book i did a really good job of explaining all of the installation and configuration procedures, step-by-step. I also carefully explained different sorts of commands and parameters in my own words which may be a bit more easy to understand reading bash manuals. If you are a beginner you can follow the steps in the book carefully and you will have a working linux cluster by the end of the book, no matter the version of CentOS used. If you are an advanced user with experience in linux clustering you will refresh your memory and learn how to work with the latest linux cluster stack. 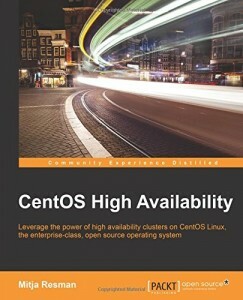 Where you can buy my CentOS High Availability book? My CentOS High Availability is available almost everywhere, maybe even in your favorite online book store – check it out. 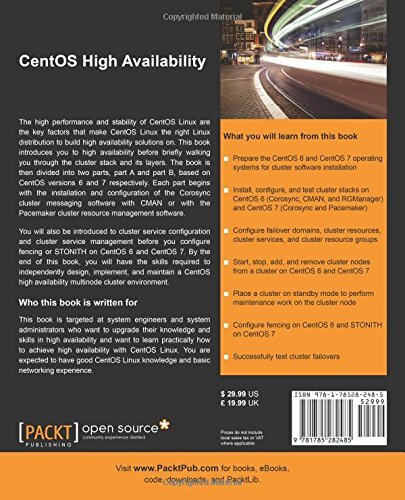 You can also get it on Amazon, Amazon Kindle store, of course at Packt Publishing and also on Apple’s iTunes store just search for CentOS High Availabitily.